No sooner do I write a bullish commentary about the repeated cup and handle formation in gold in mid-June, than the yellow metal decided to walk right back from completing the most recent example of that pattern. It is a good thing that I’m used to the market liberally heaping such indignities on me. As well, the bullish percent chart of the gold sector is at 45%. This is neutral, especially if we compare it to the February 2010 correction when it fell to 20%. That was the lowest bullish percent level for the year. 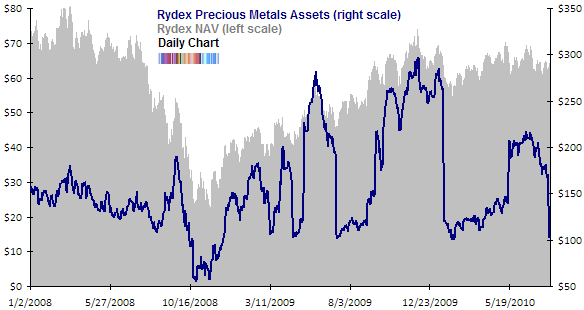 Perhaps most interesting of all is that last week we saw a huge drop in the assets of the Rydex Precious Metals Fund; from Wednesday’s $171 million to Thursday’s $102 million. The fact that we had such a large drop in assets points to a large player. Usually we see Rydex assets ebb and flow with much smoother (smaller incremental) changes. I don’t think that just because we have a large player capitulate and withdraw assets this has any less significance. The pattern is the same but what makes this somewhat suspect is that Rydex funds are not always the playground of the retail trader. After all, most retail market timers don’t have $70 million to punt around on sectors. According to the Hulbert Gold Newsletter Sentiment Index, market timing newsletters that specialize in the previous metals sector are currently recommending +9.2% exposure to their clients. While it certainly can go lower (and into negative territory, suggesting a short position) during a strong bull market this is rare. The last time the HGNSI was lower was last July when it fell to -10%. Finally, according to Jason Goepfert, the gold futures put call ratio is now more skewed (towards the bearish puts) than it has been for the past two years. While this derivative market is not the domain of the retail trader, the put call ratio of gold futures has been a good contrarian indicator historically. So the current elevated level suggests that there is real fear that prices will fall lower. So everything considered, if gold is still in a long term secular bull market, then we have several indications that the correction is over. Thanks for the post –could you scribd that citifx? i checked the trendline… its only on basic charts, on log chart its already broken… so what to think now… log scale is better in watching rising trendlines, basic chart in analyzing breakouts of descending trendlines. thats what books are saying. Babak, what do u thing? Anyone else? btw… i can see a nice falling wedge in gold and there is coming a bullish crossover in MACD (daily chart). so i will make my position according to this formation, no the trendline. What are the latest Daily Sentiment Index readings on Gold? John b, you’re right. The chart is arithmetically scaled. I usually prefer log as well but I was trying to show the reasoning out of CitiFX. Nevertheless, note that it has been able to stay above the 200 day moving average. What happened? You were posting these before. Not trying to be a whiner or ingrate (your blog is top of my list) but this was useful info. I hope you’ll reconsider. 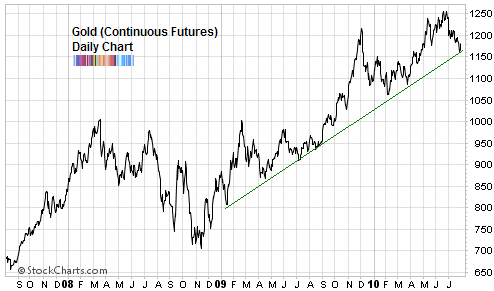 FWIW, that is where I had my trendline and I bailed on my gold position at 113.50ish after entering at 98 in Sep 2009. Still think gold is in a long-term secular bull market and looking for 3K-5K down the road, but for now I’m on the sidelines. I still think this correction could go deeper. As you note, sentiment really isn’t at a bearish extreme. Anyways, weekly MACD and PPO both on sell so I’ll wait for a signal crossing to reenter. Just curious if you don’t mind sharing Babak, what is your current positioning with respect to both gold and the overall equity market. No position? Mike, I’m going away for a few days so no positions for now. Didn’t the NY advance/decline move to a new high yesterday ? As I remember, this is an indicator you respect.